After my last post saying ‘who needs Muskoka,’ I decided, that I did, indeed, need Muskoka – at least for a weekend. Just because fall is here it’s no reason to give up on road trips, so Mark and I beetled off (actually we SAAB’ed off) to Deerhurst Resort for three nights, about a 2 hour drive north of Toronto near Huntsville. 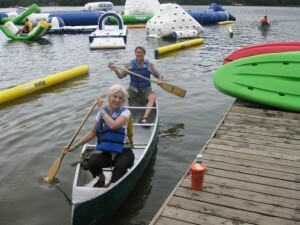 Deerhurst is a mighty big resort – you may know it as the hideout of the G8 bigwigs last year. Well, they were gone when we got there, obviously, but the cutest little English kids at dinner were asking their server about the Brit Prime Minister David Cameron, so she went and got an album of photos to show them, which was really sweet. How can you not love these ducks? Personally, I was more interested in the ducks. Mark now thinks I have a strange obsession with ducks, but I patiently and continually explain to him that not just any duck wins my heart, it was the Deerhurst ducks in particular. I mean, I can pass ducks on ponds all the time and they don’t do a thing for me, other than in a bland appreciative isn’t-nature-wonderful sort of way. 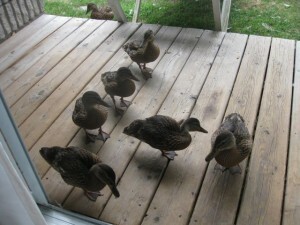 Every morning when I woke up, I would open the patio doors and they would come to say hello. I know what you’re thinking, that these ducks were only out for an early morning handout, but I politely disagree. I never once fed them, except maybe when I accidently spilled some popcorn, but even then I’m sure it was the gulls that got that, and the friendly little ducks never hung around all day, it was always a morning greeting. So then they would hang around while I drank my tea and while all the other people at the resort would walk by wondering why this strange woman was sitting outside in her groovy bright pink patterned housecoat surrounded by ducks and probably wondering if I knew there was a duck sitting under my deck chair. I, however, feel like this is a perfectly normal thing to do. 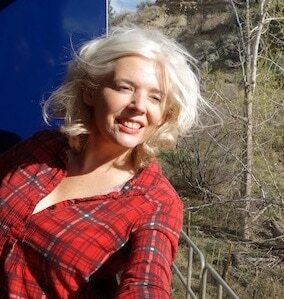 In fact, it’s better than normal, I’d wake up everyday like this if I could. Of course you don’t go up north just for the ducks. 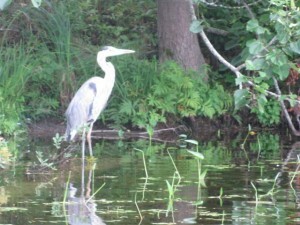 There are other water fowl that are quite captivating. Let’s go find water fowl! In the end it was a good weekend. The canoeing was spectacular and the highlights were (you know what’s coming) the DUCKS!. 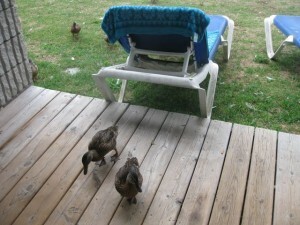 And I loved our Lakeside room, but you must get the ground floor so that you can hang out with the (wait for it) DUCKS! 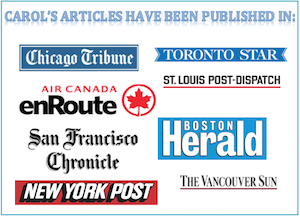 Not So Stellar Points: When I ordered steak at the hotel restaurant – two medallions – one was delicious and one was so tough even Mark couldn’t eat it and he has never turned down a steak, at least not since I’ve met him. When our server picked up our dirty dishes it was clear that my plate was picked clean except for one medallion of steak. When the server didn’t mention it, I pointed it out and said it was too tough, unlike the other delicious one. The server was nice, and said something like ‘isn’t that too bad?’ or ‘Oh, I’m sorry,’ but there was no offer to get me another or take it back. Hm. 1)The staff were all super nice, especially the desk clerk who let us check out a gazillion rooms until we picked the one Mark had wanted all along, the ground floor Lakeside room. 2)The spa. I had a super good facial. Oh, I loved my therapist. The spa has recently been rebranded to a Shizen Spa – of the Cosmo Hotel and Pantages Hotel fame – so I checked it out. I once won a couple’s massage treatment at the Shizen Spa at the Cosmo and – maybe because I was single at the time – I never used it! Now I’m really regretting letting it expire. 3) More than pleasantly surprised by some local restaurants in Huntsville. Breakfast at 3 Guys and a Stove. Quick lunch at the Butcher’s Daughters and the fresh pasta at some little Italian place on the main street that looks like a coffee shop, I think it was the charmingly named, That Little Place by the Lights. And really good chocolate gelato there, too. 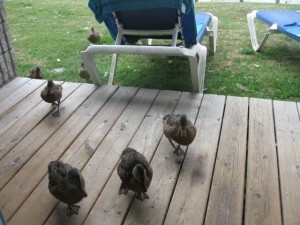 4) Okay, and please let me say it again … I loved the Deerhurst DUCKS! Yay for fun weekends in Muskoka! Oh, Buxton is such a cute town. I hear rumours that you are staying at the same hotel where Mary Queen of Scotts was hosted, (ie imprisoned). How historic can you get? 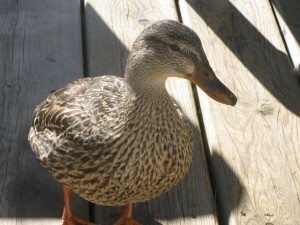 I absolutely adore ducks! We are in Buxon right now and there are ducks everywhere! Tell Mark I have an obsession with ducks too! It’s must run in the family. My poor mother must be getting so annoyed with all my duck talk here! Thanks for all your tips about England. We are having a wonderful time.